Product prices and availability are accurate as of 2019-04-21 17:32:23 UTC and are subject to change. Any price and availability information displayed on http://www.amazon.com/ at the time of purchase will apply to the purchase of this product. The SkiGear Men's Insulated Cargo Snow Sports Pants are an outstanding value-priced garment that is wear tested to offer maximum protection from the elements and superior quality. The improved fit delivers great true-to-size wear ability and comfort. Perfect for skiing, snowboarding and outdoor activities in cold, wintry conditions. Two front zippered pockets. Reinforced scuff guards add durability so you'll be ready for action, season after season. Snow scuffs form a seamless integration with boots, keeping snow out, warmth in. 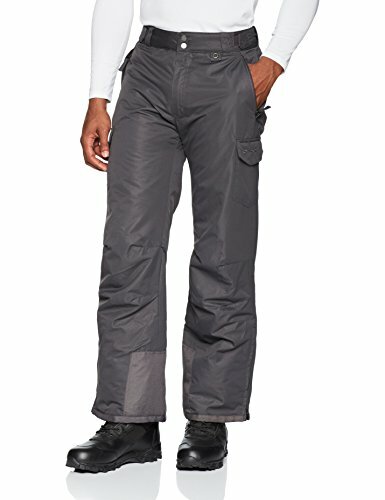 SkiGear men's snow pants provide men with comfort and warmth when playing or working in the cold. Our men's ski pants and snowboard pants are perfect for snowboarding, skiing, hunting, fishing, staying warm at cold football or hockey game, or clearing the snow after a storm. If you're on the slopes, SkiGear snowboarding gear will keep you looking good and feeling good. SkiGear by Arctix is the #1 supplier of black bottoms to the snow sports industry, offering high-quality, value-priced Snow pants, Ski Pants & Bib Overalls. SkiGear bottoms are perfect for active sport lifestyles, including snowboarding, skiing, playing outdoors, working in the snow, shoveling or blowing snow, ice fishing, hunting and attending outdoor sporting events. Unlike most competitors, SkiGear snow pants and bibs are made of Nylon fabrics with ThermaLock coating and ThermaTech Insulation. SkiGear snow and ski pants are designed for maximum comfort and motion.